Style 7545 is an 18 ounce Boat and Tooling Fiberglass identical to style 7544. 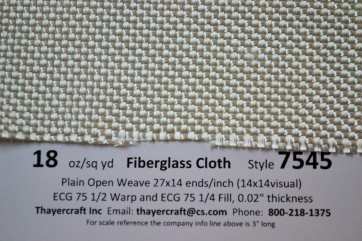 7545 is described as a 17.7 oz/sq yd Fiberglass Tooling type Fabric with a thread count of 27x14 - visual 14 x 14 approximately. The weaver has the weight value for 7544 at 17.6 oz/sq yd with a thread count of 28x14. Information from the same weaver for both 7544 and 7545 also have both using the yarn ECG 37 1/2 (2 each) in the warp and ECG 37 1/4 in the fill. The big question for both is why is the thread count 28 x 14 ends/inch if it just looks like a plain weave with the same thread count in both directions? What happens is the way the weavers differentiate the two yarn in the warp laying next to each other versus two twisted together in the fill. 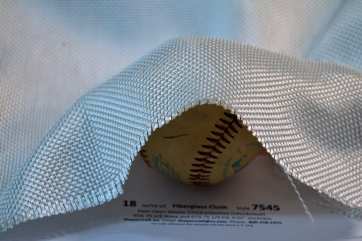 The 14 ends/inch G yarn in the fill are 4 of the individual ECG75 yarn twisted together whereas there are 2 each of the 2 twisted ECG 1/2 yarn in the fill. In other words both the warp and fill have the same number of filaments but are just counted differently as is indicated by the description of the weave as "2 end plain" for 7544. The 7545 for the weaver is given as a "plain weave" and no indication of the two warp counted. The yarn is the same for both. There's a discrepancy in the thread count with 7545 just less than 7544 but that would contradict the weight where 7544 is given as less than 7545 though neglible. So one could assume that 7544 and 7545 are identical. The real difference in the 7545 and 7544 what you're getting from us is the finish and the way the two handle. If you need a soft fabric or are using any resin other than epoxy we have 7544 on the previous page. The 60" wide style 7545 is finished in the epoxy functional Z6040 Silane. Z6040, being an epoxy functional silane, is assumed to have somewhat improved bonding with the epoxy resin. The trade off is somewhat less drape but is still pretty soft. Z6040 is a Silane producer. There are many variations of silanes based on this Z6040 base silane. As always what you see in the photos is what you get. All rolls are rolled on 2" pvc and packed in 1 - print prevent layer, 2 - plastic tube, 3- smooth side corrugated wrap and a final wrap on the outside. All roll lengths are linear or running yards. Prices have free shipping to the 48 continental United States.